It was a warm but wet return to Brighton after a sunny trip to Cornwall, so I wanted something both comforting and fresh when I got home. I generally use short grain brown rice as it holds so much more liquid, and when properly cooked, is fluffy and light. So many guests have asked me what rice I use as it’s so much nicer than what they expect from brown rice, and much more delicious and nutritious than white. Soaking grains such as rice helps to reduce the phytates and so make some of the minerals more bioavailable. I usually add a splash of lemon juice to make this process more efficient, and also to kick start a fermentation process. Sometimes I soak the rice for up to 48 hours (with a water change half way), and the rice always feels a lot easier to digest. If it’s a last minute decision, though, then I rinse the rice thoroughly and cook it as usual, thanking the phytates for their own nutritional benefits. 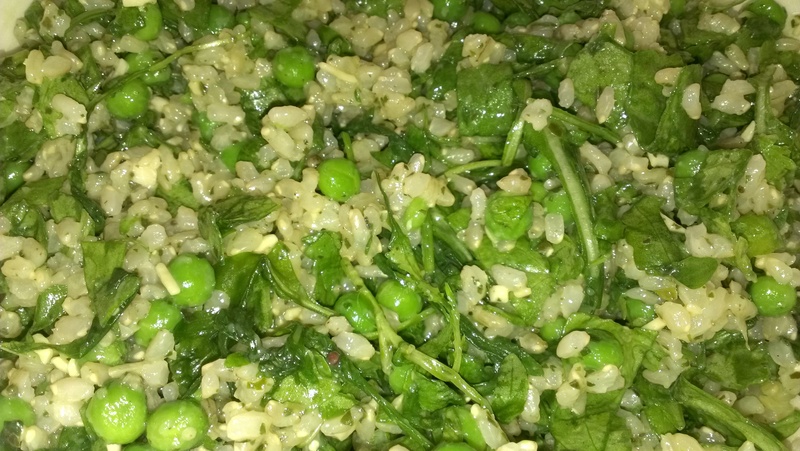 Adding the peas ensures you have all the essential amino acids you need from food to make all the protein structures in your body, and together with the green leaves, you have a dish that provides magnesium, potassium, vitamin C and other revitalising nutrients. Use twice as much water as rice, bring it to the boil, and simmer for around 45 minutes or until soft. I have a Schulte-Ufer thermal pot, so I bring it to the boil on the hob, put the saucepan in its thermal “coat” and let it sit for around 45 minutes, cooking itself with no additional heat source. Stir it all together (the leaves will wilt in the warm rice), season and serve. Simple but delicious, either on its own, with a lemony sauce or as a side dish.